It’s been six exasperating months during which I have tried to deal with Daisy’s ongoing bitchiness towards the entire herd – particularly towards Kashka, until about three weeks ago I read somewhere an author lamenting that we no longer groom one another. A week or so later Matt, whose farm, with Sasha I’m looking after in their absence, commented: “Look at Billy’s beard. Do you polish it?” And I laughed, but then the word ‘groom’ popped back into my mind. One or two mornings later I thought that now the tick season has passed and I have more time on my hands between milking each goat, why not rub each one down? I now groom every goat daily – even Billy. The herd glistens in the Overberg sun. Maybe it’s because I live alone but I’ve also taken to talking to them. 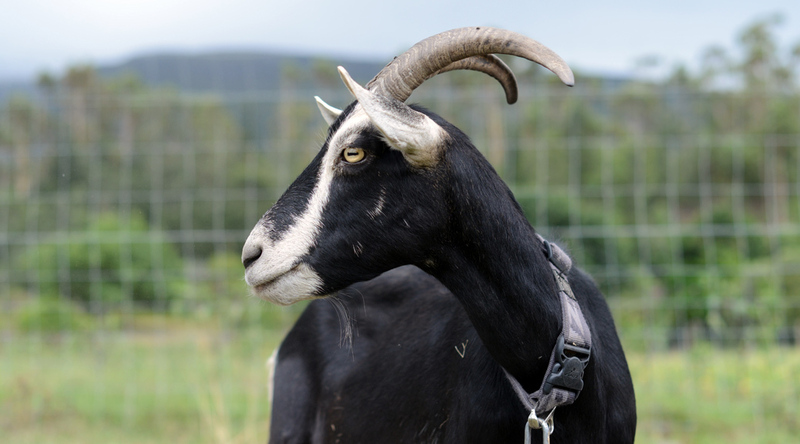 Not in goat language – but in English, adult to adult. For instance, today I told Daisy she mustn’t try to slip back to feed from the kids’ lucerne once I’ve indicated it’s over. She looked at me with those clear yellow eyes of hers. OK.
Last night when I untethered Daisy after feeding time, she didn’t immediately push aside Peggy-Sue to get to what was left of her lucerne, instead she continued lying on the fresh straw, chewing the cud sleepily. The message I glean from the goats: we share our milk, we accept that in the great scheme of things you’ll take and slaughter our kids, therefore is it necessary also to disrespect us? I loved reading your story about Daisy. Goats have always intrigued me and they have the most comical faces and fascinating eyes. How kind of you. Goats are uncanny. I looked after another goat, Bella, for a neighbour who, because of the connection that was subsequently forged (Bella and I), suggested Bella should return.